I’m done and almost 2 weeks early. That’s huge for me — I’m such a procrastinator. I hope they fit well. The lace makes them quite stretchy so I blocked it slightly stretched (there’s lots of give in these socks). I still think this pattern would be nice as a scarf. Here’s a closeup. The Lorna’s Laces is great to work with. I could easily knit this yarn without looking and only occasionally did I split the yarn. Yardage-wise, I have almost 2/3rds of a hank left over. There’s lots left and my LYS still has some of this color in stock. I’m tempted to buy another hank and make a different pair for myself, but I’m not particularly excited to knit with the same color. Maybe I should buy a complimentary color and stripe them? A few of you asked how I knit these toe-up. This pattern was VERY easy to adapt to toe-up. Here are my mods. CO 32 using figure 8 onto 2 circs. Knit one row. Increase Row On each needle K1, inc 1, knit to within 1 stitch of edge, inc 1, K1. After you have 52 sts (26 sts per needle), do an increase row followed by a plain row until there are 64 stitches total. Knit 4 rows plain. I do this because I don’t like the patterning to start that close to the toe. This is just my own personal preference. Begin patterning Knit the wave pattern on one needle and knit the second needle plain. Knit this way until the sock is about 1.5 inches shorter than the foot. Heel Do a short row heel until, keeping 16 sts unwrapped, and 8 sts wrapped on either side. Begin Leg Continue knitting the pattern on one needle and st st on the other needle until you’re at either a Row 1 or Row 11. Then knit the pattern across both needles. Knit until the leg is the desired length. 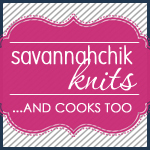 I knit 3.5 repeats. Cuff I followed the scalloped edging chart, simply turning it upside down (knitting Row 14 first). Cast off Cast off using your favorite stretchy cast off. I used EZ’s sewn cast off. the socks look fantastic! hooray for finishing early!! Beautiful socks! You’ll have a happy pal. I love the color and pattern both. Those socks are great! Your pal will be so lucky. I have to try the pattern myself! Although I’m not part of the River KAL, I just started knitting it today using KSH in Trance. Thanks for the chart. To avoid confusion, you might want to mention that although the row numbers are printed on the right, the chart needs to be read from left to right. Or, alternatively, do as I did and print out a mirror image and read the chart from right to left. Thanks again. These are the prettiest socks! Heavenly I tell ya! I’ve been looking at NOLA pics all afternoon online. THese socks are like heaven to look at! They are beautiful…your pal is sure to love them! I love that pattern and the very cool color. Great job. Your Waving Lace socks look really beautiful. – I’m also knitting a pair for my Sockapal2za pal but I’m worried (hopefully too much) that they aren’t big enough. Beautiful socks Jody!! Your pal will be thrilled! Gorgeous socks! Great job! The color is a super color, your pal will be very happy. Beautiful. The cuff is really lovely, and adds a lot. 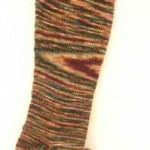 Stripes would be cool, but I hate weaving in ends on socks! Perfect. Perfectly lovely. Perfectly wonderful. 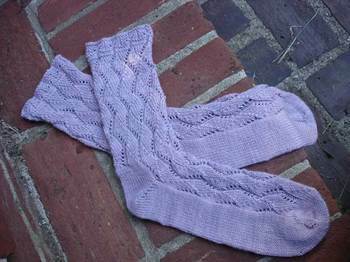 I love the lace pattern you chose for your Sockapalooza pal! Your socks turned out beautifully — and early, no less. Isn’t the Lorna’s Laces sock yarn wonderful? It’s easily my favorite. What a lucky pal you have!